It was while being hypnotised by the revolving chickens at Sainsbury’s that I realised I was facing my first day off sick. The children were largely sympathetic upon my return. “Just sit down and relax” suggested a kind child in my class. “But there’s 30 of you and only one of me” I groaned. This was not strictly true. There were 29 children; one was off sick today with “slap face”. I had to look this condition up to make sure she wasn’t a victim of bullying. I heard the news that I will be working along with the woman who only talks to me through the medium of her baby. This is fine; I will introduce her to our class puppet Franklin who will do all the talking for me. Little does she know he has severe Tourette’s syndrome. The last day with my class brought tears to all of our eyes. I’d promised a girl in my class I would wear a shirt she’d bought me. I’m of a slender build but this was so slim-fit I couldn’t move my arms. Working in a school teaches you things, I learnt I can avoid breathing out for 6 and a half hours. As I played a farewell slideshow I’d made to the class, their tears fell readily too. More tears of boredom though, because it was 142 slides long. They brightened up during the class party and for the first time I really completely allowed myself to enjoy their company. I’ve lost count of the wobbly teeth I’ve had to feign interest in, the wobbly lips I’ve had to comfort and the wobbly moments I’ve had while teaching but it’s all been ultimately worth it. We finished the day by tearing the classroom apart. With the asbestos lined walls to be removed it was all the excuse we needed to…then I heard a squawk. I remember thinking “oh god…oh no…for the love of God…not Word Bird!” It was too late. An overzealous child had ripped him from the wall. Word Bird has been with me from the start. 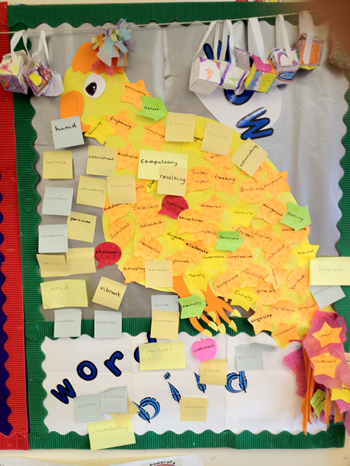 He’s a bird we’ve stuck post-it stickers to of newly learnt vocabulary. He coughed and spluttered in my arms as the children made a reverential circle around me. “I’m feeling ravenous and carcinogenic” Word Bird croaked, spewing a fountain of post-it stickers. “Hang in there Word Bird!” I pleaded, whilst also admiring his extensive vocabulary. “Deciduous…astute…benevolent” Word Bird by now was raving; I knew the end was in sight. His last words were slightly obscured although I think he finished with ‘xenophobia’ and possibly ‘antidisestablishmentarianism’. We held a minute’s silence. Our first considering we have a child with ADHD. I’ve reached the end of my first year of teaching. I’ve said goodbye to a class that I spent so much time pretending I didn’t love to bits. I may only be the merest blip on their radar of life but I adored and will never forget them. I’m not entirely sure what to do with my time now, so I’ve set my mind to building ‘Word Bird Mark 2’ or ‘Son of Word Bird’ (whichever sounds catchier). He’ll be better, stronger and have more post-it stickers. How we will remember him. This entry was posted in Uncategorized and tagged asd, attention deficiency disorder, autistic spectrum disorder, children, class, classroom, education, experiences of a teacher, kids, learning difficulties, male primary school teachers, male primary teacher, male primary teachers, male teacher blog, NQT, PGCE, primary, primary school pgce, primary school teacher blog, primary school teachers, primary school teaching, primary teacher blog, primary teacher blogs, SEN teacher, sen teacher training, sen teaching ideas, special educational needs, special educational needs sen, special educational needs teacher, teach primary school, teacher, teaching, teaching assistants on July 19, 2012 by timlondinium. She didn’t even wait till the end of term. The woman whose classroom I took over, was back. She worked busily around me pulling her resources off the wall, emptying drawers and raiding the cupboard. I felt like a bitter divorcee as she took it all. I had my new class to meet anyway. Their current teacher had briefed me beforehand for the ones to watch. One child, in particular, has all the hallmarks of what the most liberal teachers would describe as a ‘character’. He had openly jumped and shouted when she’d told the class she was leaving the school. For a leaving a present he’d bought her hair removal cream. I admire his sense of humour at least. I told the smallest of white lies that the letters they’d written for me were thought of as either Year 2 or Year 3 works by my current class. I had in fact just relayed the funniest bits to them, from the child that likes ‘winging it’ to the one that ‘wants to learn his 12 times table while zipping up his coat’. I also met the parents of my new class and inexplicably found myself telling the same lie to them. I’m too eager to please sometimes. My classroom cleaner is permanently tired. She is prone to melodramatic outbursts such as “I’m so tired, oh Lordy take me now!” but her languidness is thankfully contagious with my class settling into a neat end of term listless groove. They didn’t even react hysterically to a pigeon flying into our classroom. My ability to guide it out with the minimum of fuss has earned me both the nicknames of Dr Dolittle and the Pigeon Whisperer. The one thing to break their torpor was an improvised visit to a playground they had not visited since their reception days. I sat back and watched them jump up and down, shout, scream and run in every direction…mind you, how were they supposed to know I was only firing blanks? (That’s a joke NSPCC). This entry was posted in Uncategorized and tagged asd, attention deficiency disorder, autistic spectrum disorder, children, class, classroom, education, experiences of a teacher, kids, learning difficulties, male primary school teachers, male primary teacher, male primary teachers, male teacher blog, NQT, PGCE, primary, primary school pgce, primary school teacher blog, primary school teachers, primary school teaching, primary teacher blog, primary teacher blogs, SEN teacher, sen teacher training, sen teaching ideas, special educational needs, special educational needs sen, special educational needs teacher, teach primary school, teacher, teaching, teaching assistants on July 13, 2012 by timlondinium. There is a scene during ‘Nightmare on Elm Street’ in which Freddy Krueger rips open his sweater and the sound of a thousand children’s souls are heard. It was a noise similar to the sound my class made when I told them sports day was cancelled. Then I dropped the real bombshell that some nice people from the local bank were coming instead to talk to them about finance. They kept the children occupied with money exercises, puzzles and word searches, albeit with an obligatory financial slant. It’s not every day you hear a child say “I’ve just found ‘loan shark’!” I somehow ended up with £10 blue tacked to my backside like a stripper. By the end of the lesson I had £20 stuck there. Still, that’s inflation for you. One of the class told me that a girl was crying. “No” I replied confidently “she’s just bored to tears”. She was actually on the verge of being sick. I helped the girl to the nurse before she projectile vomited across the knees of some already miserable looking children. “Thanks” sneered the school nurse. “I told her to wait till she got to you” I joked. I’d already travelled into work with toothpaste smeared around my mouth so my expectations of the day were low. A Year 6 teacher told me that now the SATs were over, his children’s behaviour was spiralling out of control. “It’s like the films over, the lights have gone up and I’m force-feeding them popcorn just to keep them in their seats”. My own class have pushed the boundaries of late and on my ‘no more than 70% energy’ days they claim the odd victory. During a writing exercise I watched the space cadet in my class waxing his leg with a sticker. Another child excitedly told me he was born on his birthday. On neither occasion could I muster enough to do the right thing. Children can be unexpectedly thoughtless and cruel too. One child told me he had not learnt much this year, another how she wished a TA, rather than I, would have taken them on a trip to the local library (you can’t even ‘playfully cuff’ them anymore). ‘Pirate Day’ was a welcome relief. I wore a hook which more than anything reminds you of how often during the day you pick your nose. I gave an eye patch to the classes ‘Word Bird’ and mistakenly allowed one of my children to apply face paint to me. I wanted to look like Blackbeard instead I resembled the Joker from Batman. I finished the day meeting the teacher of the class I will inherit. She told me in some detail about them as I glanced at their cheery faces in a school photo. I spent so long sat on the far-too-small-for-me chair that as I straightened and left the room I said to myself “oh my arse is numb”. The janitor appeared at this point and shot me a look as if he’d stumbled upon a secret cult. The reports have been sent to the parents. The last homework marked. The spellings set. The levels completed. I have two weeks left to complete my first year of teaching. As I arrived home I looked in the mirror determined to remind myself of just how much I’d achieved. All I saw staring back though was a man who’d forgotten to take off his face paint. This entry was posted in Uncategorized and tagged asd, attention deficiency disorder, autistic spectrum disorder, children, class, classroom, education, experiences of a teacher, kids, learning difficulties, male primary school teachers, male primary teacher, male primary teachers, male teacher blog, NQT, PGCE, primary, primary school pgce, primary school teacher blog, primary school teachers, primary school teaching, primary teacher blog, primary teacher blogs, SEN teacher, sen teacher training, sen teaching ideas, special educational needs, special educational needs sen, special educational needs teacher, teach primary school, teacher, teaching, teaching assistants on July 6, 2012 by timlondinium.